148 Denison Iowa. June 26th 1880 The Denison. Total Abstinance. Union. met at the Court House the President in the Chair. meeting opened by singing by the choir. and Prayer by Bro. A.F. Bond Minutes of last meeting read and approved. Music by the choir. Reading by Mrs E.S. Plimpton Music by the Misses Wilsons and Wheeler. Program for next meeting. 1st Reading by Mrs Phelps and [illegible] 2. Music by Mabel Wilson. and Fannie Wheeler. 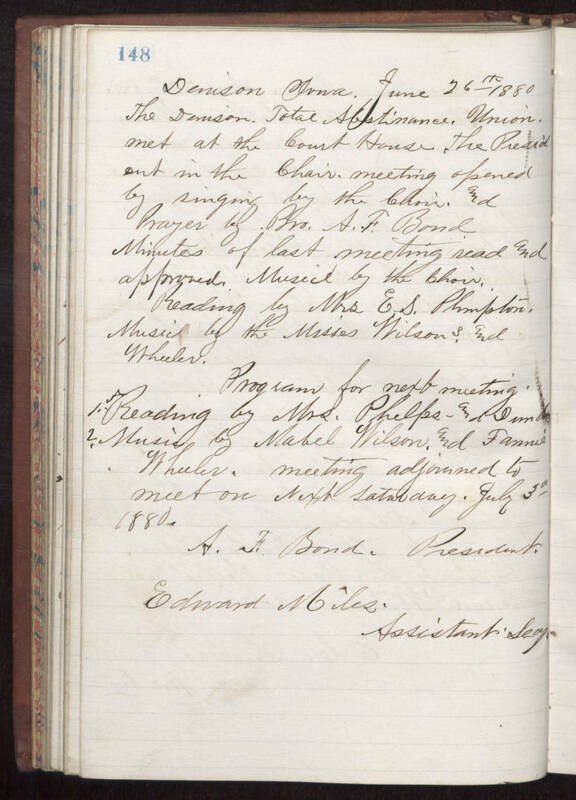 meeting adjorned to meet on next Saturday, July 3rd 1880. A.F. Bond, President. Edward Miles, Assistant Secy.